Through the Supplier Development Programme, North Lanarkshire Council arranged for two Public Contracts Scotland training sessions in March 2019 to provide practical assistance to SMEs interested in apply for a place on its 1140 Hours interim Framework. Weans World Childminding is SDP’s featured SME business for the month of March 2019. Geraldine Duffy, Owner of Weans World Childcare, really enjoys her job, despite it being challenging at times. She loves helping young children reach milestones and teaching the wee ones, especially those who have no siblings, to share and be part of a team. Together with her husband, Chris, who works as her assistant, Geraldine’s childminding business goes from strength to strength, and Weans World received an excellent grading in its annual inspection from SCSWIS. Teaching children how to be independent is very rewarding for both her and her husband. 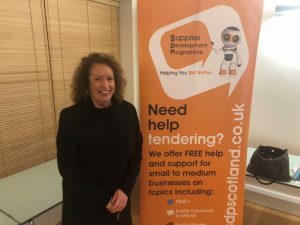 Geraldine attended the Supplier Development Programme’s second training night on how to bid for North Lanarkshire Council’s 1140 Hours interim Framework opportunity public sector work through Scotland’s public sector procurement website, alongside more than 60 public and private early learning providers on Thursday, 21 March 2019. Five years ago, Geraldine tendered for a similar contract for North Lanarkshire Council, which was not a good experience. She had not undertaken any training for that previous opportunity, and harboured serious concerns that the 2019/2020 early years public contract would result in a similar negative experience. All of her fears were dispelled when she attended the Supplier Development Programme’s training, delivered in a calm and warm manner by trainer Gill Joy of Intend Business Development. This training has given Geraldine the confidence she needs to use the PCS-Tender portal and submit a bid to continue to deliver her services for North Lanarkshire Council. As part of a phased 1,140 hours expansion implementation strategy, North Lanarkshire Council Education and Families Committee approved the procurement of an interim Framework for 2-5 year olds which will last for one year. The Framework is open to all private sector providers including Childminders and Private Nurseries who can provide 1,140 hours capacity within North Lanarkshire. Weans World was established in 2011 and is located in Shawhead, Coatbridge, North Lanarkshire. Download the case study in .pdf format.